Ruins of the Spring Valley Christian Chu rch in Hardwick. The church was part of the Christian Connection, the first American church, a loosely formed group not affiliated with any European denomination Photo by Diane Pratt. 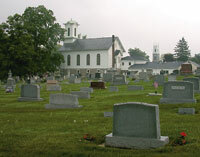 Weekend travelers can find many reasons to visit old churches with graveyards: love of architectural details, interest in gravestone art and epitaphs, a passion for genealogy, a search for history, or simply the enjoyment of walking through a quiet place filled with so many long-ago stories. Where better to start than in Warren County, which boasts over forty churches built before the turn of the twentieth century. Those with graveyards number far less, though, and a few selected ones are listed below. For a serene afternoon's outing, take a camera or a sketchbook along, or perhaps paper for rubbings as you wander through these stone testaments to Warren County's history. It won't be time wasted. Note on gravestone motifs: A common design on graves is a tree (perhaps a weeping willow) that symbolizes the biblical Tree of Life; a lamb indicates innocence and/or a child's burial place, while an upright hand, palm out, points upward to Heaven. Flowers prove a common theme as well, symbolizing many different things, including beauty, sorrow, respect, grief, condolences, etc., while wreaths generally mean victory. Hackettstown's Second Presbyterian Church actually predates the First which sits on the other side of Main Street. Although the congregation was founded in 1763, the actual church was built in 1819. A Greek portico--erected in 1838--was added to what looks like a more traditional meetinghouse church of white clapboard. 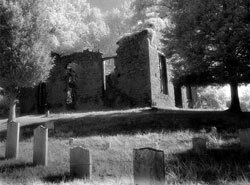 To the right of the church behind a stone wall lies the cemetery, with a couple of hundred markers; this cemetery dates from the late 1700s. Numerous sandstone markers can be found, along with one displaying an angel with a dour visage, perhaps carved by Uzal Ward of Newark; many have epitaphs engraved on them, although some are too weathered to read now. American flags and round Revolutionary War emblems mark the two dozen or so patriots who fought in that conflict (but lived to come home) and rest here. As a bonus, walk across the street to The First Presbyterian Church, which is actually the third one built by the congregation, this time in 1860 at a cost of $18,000. The white clapboard church's style is an example of Wren-Gibbs architecture (common for America's early churches--rectangular, tower or spire toward the back, interior galleries, etc.) The large memorial stained glass windows were installed around 1906 or 1907 when the church was remodeled. It is now considered the oldest church in town. The Marksboro Presbyterian Church (Rt. 94, Marksboro NJ) in Frelinghuysen Township was founded in 1814 by Reverend Robert Finley of Princeton. At that time, the area was part of Sussex County. This small meetinghouse-style church was built in the 1880s, and maintains an old belfry; the carillon is now electric. A number of graves date back to the first few decades of the nineteenth century, and some Civil War soldiers are buried here. In the far right corner of the cemetery note the Andress family plot with its immense marker with a carved urn and burial shroud. A lamb atop a small gravestone, located at the front of the burial ground close to the black iron gates, marks the grave of a very young child. The epigraph reads: "Dearest Davy / Thou Did'st But / Touch The World / On The Way to Glory." From Marksboro, head west on Rt. 94 for a short distance, then turn left onto Rt. 521 before entering Blairstown. South of the Rt. 80 overpass you'll find the old town of Hope (Rt. 521 meets Rt. 519 at Hope). The St. John United Methodist Church (354 High St., Hope NJ), with a stone and board construction, was built in 1876 in the Gothic Revival style (the congregation was founded in 1826). Alongside stands the Moravian Cemetery, dating from the mid-1700s (the first marker is dated 1768); a black iron arch announces the cemetery. The Moravians settled in "Greenland," as they called in, after leaving Bethlehem (PA). These people of German descent were known for their numbered gravestones embedded in the ground, many of which can still be seen here. Especially notable among the markers is a Celtic cross and graves of Civil War veterans, as well as the many epitaphs. One reads: "Lord Jesus, Receive My Spirit / Let me die the death of the right- / eous, and let my land end be like his." 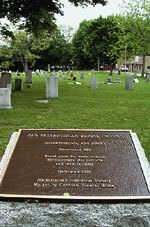 A large marker at one end of the cemetery is "dedicated to the sacred memory of 62 persons who died in the early Moravian settlement of Hope, NJ." This list of names and dates of births and deaths was erected in 1966 by the Society of the United Brethren for Propagating the Gospel Among the Heathen. A handful of the blue limestone houses built by the Moravians can be seen around the town; "year" plaques can be seen on the houses. Their own "Gemeinhaus", or meetinghouse dating from 1781, still stands at the corner of High St. and Rt. 521, but now houses a bank. Much of the architectural detail remains, including an impressive wooden stairway inside. St. Luke's Episcopal Church (346 High St., Hope NJ) sits just a few buildings away from the Methodist church. Reverend William Bulgin, the pastor in 1832, designed the Gothic Revival structure. Inside can be found a curved staircase and stained glass windows, all of which came much later. The church is listed on the National Register of Historic Places. South of Hope stands the Presbyterian Church of Oxford at Hazen (Rt. 519 and Brass Castle Rd., Hazen NJ), erected in 1856. The congregation of this brick meetinghouse-style church was founded in 1729, and lies outside of Oxford on the road to Belvidere, the county seat. Visitors should note the unusual scalloped eaves of the roof and the stained-glass windows in the front. The graveyard features half a dozen or more above-ground crypts, including one with an open end ... and which proved empty. This is also the last resting place of one Joseph Mackey (Apr. 12, 1741 - Oct. 12, 1798), captain in the first Regt NJ T&P, Revolutionary War, or so reads a bronze plaque inset before the soldier's gravestone. The visitor can see other Revolutionary War and Civil War graves as well. Farther down the road, the Presbyterian Church of Harmony (Rt. 519, Harmony NJ) seems to float in a sea of gravestones. 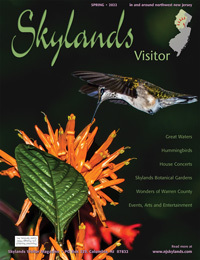 A visitor can stand amid the stones next to the parking lot and see the top of the Delaware Water Gap in the distance. The white clapboard meetinghouse was built around 1890, although the congregation was founded in 1807. One plinth's epitaph reads: "until the day break." Two graves mark those of a sister and brother--both died on the same day, but two years apart. The girl was three days short of her first birthday, the boy only a month and a half old. Phlox weaves a pink and white carpet between the old headstones, dating back to the early 1800s and including veterans of the Revolutionary War and Civil War, along with a World War I vet. A statue of a woman in classical dress and leaning against a stone rests here as well. The Old Greenwich Presbyterian Church (17 Greenwich Church Rd., Stewartsville NJ) lies south of Harmony and was founded in 1740. The plaque, dated 1930, at one entrance to the stone church is dedicated "to the memory of the revolutionary patriots buried in Old Greenwich Cemetery," and it lists nineteen names. The plaque at the other entrance is in "honor of General William Maxwell," and was given by the Sons of the American Revolution in 1942. Maxwell, a Brigadier General in the Continental Army, is perhaps the most famous person buried in the cemetery. Washington wrote that he was "an honest man, a warm friend to the country." A plaque marks his crypt. This graveyard is many times bigger than the other cemeteries listed, and iron gates with a green "G" inside a green wreath open to let the visitor drive in. One epitaph reads: "Let worms devour my wasting flesh / And crumble all my bones to dust / My God will raise my frame anew / at the revival of the just." The stone at a child's grave reads: "Tread gently by the grave / Where little Willie sleeps." Curiously there are no other graves nearby. Numerous flags and plaques dot the graves of the veterans of the Revolutionary War, the Civil War, World War I, and World War II, even now that those men are passing into history.